London’s Docklands is one of the most exciting areas of the capital. Once the docks teemed with men and ships from all over the world, now all is transformed and a new and vibrant area has grown up with commerce, stylish housing, fashionable shops and restaurants. In this fascinating book, the author takes the reader on a journey. He outlines the historical development of the area from Roman beginnings and the Elizabethan Legal Quays to the construction of the largest system of docks in the world. Life in the docks is described, including their often fraught industrial relations, their eventual demise and the re-birth of Docklands with the development of Canary Wharf. Dockland’s historic riverside pubs are described, and its former industries, pioneering voyages and fine churches. 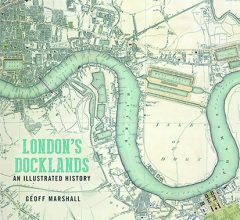 This is a very well researched book which will prove of great value to anyone with an interest in the history of the London Docklands. I would like to have seen more photos of actual shipping in these docks but nevertheless it is a good book I would highly recommend it to our readers.